At our Dodge Chrysler Jeep® service center, we handle all types of tire service and repair. As your preferred Jeep dealership serving Fort Wayne, IN, you know you can count on our expert technicians and state-of-the-art facility. Neglecting your tires is risky and frowned upon, as they’re the main contact between you and the road and offer the essential traction you need on the road. Don’t take a chance with the tires on your car, truck, or SUV. Instead, bring your vehicle in for service today! When you visit Glenbrook Dodge Chrysler Jeep®, you’ll see that we offer an array of services to optimize the performance of your tires. One service we perform regularly is a tire rotation. Rotating your tires is necessary to ensure they wear evenly and provide a smooth ride. As a general rule, you should rotate your tires every other time you get your oil changed, which is usually about every 10,000 miles. For more specific guidelines about when you should rotate your tires, consult your owner’s manual or ask one of our knowledgeable technicians. We also perform wheel balances and wheel alignments, along with air pressure checks. The air pressure of a tire is especially important for a number of reasons. An under-inflated tire results in poor responsiveness and overall performance, while an over-inflated tire causes a loss of traction and a harsh ride. Either way, your vehicle suffers tremendously when the pressure isn’t at the correct PSI. Should you need a new set, we have the tools and resources to install tires on your RAM 1500 or Jeep Wrangler in our car service center. We’ll be glad to repair damaged tires when necessary, such as if a nail causes it to lose air. If your tires need the attention of a professional, you’ll be happy to know you can save money in our Jeep service center, as we regularly offer car service and parts coupons near Warsaw. 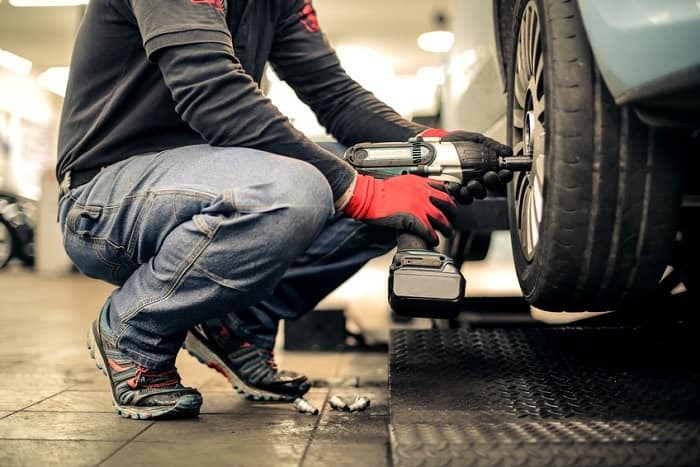 To learn more about the tire services that we provide and why it’s crucial for you to have your tires serviced regularly, give us a call, schedule service online, or stop by Glenbrook Dodge Chrysler Jeep today. We are located at 100 W. Coliseum Blvd in Fort Wayne, IN.